Roaming Stamper: New catalog order! I'm patiently waiting until 1 p.m. central time to be able to place my first orders from the new catalog. It's not easy waiting because I want my new "stuff" now! I just hope we don't crash the server when we all log in to order at the same time! 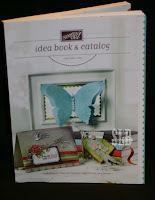 If you haven't picked up your new catalog yet, email me or give me a call and I'll get it to you! I'm in the process of planning upcoming classes and will be sending out a newsletter this week with more information on that. You can also check back here because I will post it once the newsletter is sent. Have a super day everyone, we already ran into a little rain earlier. Here's hoping we get some more and some much needed cooler weather! Hi Sharon, it's me, your plane mate back to Dallas from convention!!! I have been checking your blog since we got home...How was your open house? I see your cute card that you made! I wish I could have swapped with you! I had nothing left by the time we were headed home! My open houses were fantastic! Of course, it's easy when you have great customers like I do. We laughed, we stamped, we ate, and we had fun talking about the new catalog! Thanks for checking out the blog. I've been so busy unpacking boxes this week that I haven't spent much time blogging or stamping but that will change Thursday when my order comes! Hey, Sharon!! How fun to find your blog! :) I was looking at some facebook scrapbooking friends, followed their links, followed some more links (Linda McClain) and ended up on your blog. Small world, huh? I look forward to seeing you in October in Temple! :) Seems like forever since we were there!